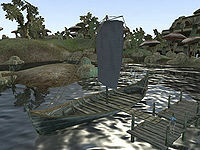 The Frost-Ghost is a small open boat just north of the Foreign Quarter in Vivec owned by Ano Andaram who is offering transport. It can take you to Ebonheart, Hla Oad, Molag Mar and Tel Branora. There are no items or people on deck. This page was last modified on 7 September 2015, at 20:06.